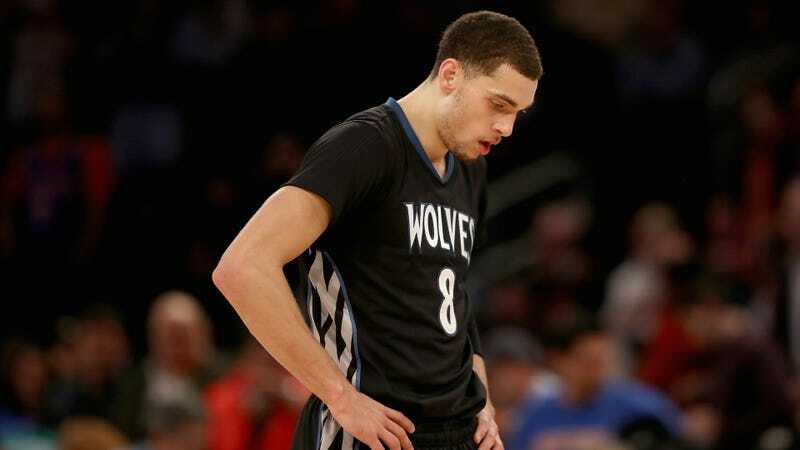 Timberwolves guard Zach LaVine will miss the rest of the rest season with a torn ACL, the team announced today. LaVine injured his left knee yesterday in a loss against the Pistons, in the middle of what had looked to the best of his three NBA seasons so far. He’s currently second in minutes played for the Timberwolves and third in both points scored (18.9) and assists (3.0). The Timberwolves were already in a place that was not particularly enviable, and this news only makes it less so. The young core of LaVine with Karl-Anthony Towns and Andrew Wiggins could at least be fun to watch, even if the team wasn’t going to win much; losing a member of that trio only makes the rest of a losing season feel that much longer. But c’est La Vi(n)e.